Victor Pauca sits at a small table with his speech therapist, who asks him what he wants to do: play with Dora the Explorer or Spiderman? No blackboard interaction here. Instead, her chalk is an iPod Touch. On the screen she shows Victor images of each toy, encouraging him to make his choice by touching the appropriate “button.” Victor, who has limited speech and motor skills, curiously eyes the screen and touches Dora. He waves his arms triumphantly as she sets the toy spinning around the table. In Victor’s classroom at Winston-Salem’s Children’s Center for the Physically Disabled, dictionary-sized assistive and augmentative communication devices (AACD) with four-figure price tags have been set aside in favor of something more adaptable and less expensive: touchscreen technology. Victor’s teacher, Chris Sladky, holds help in the palm of her hand. 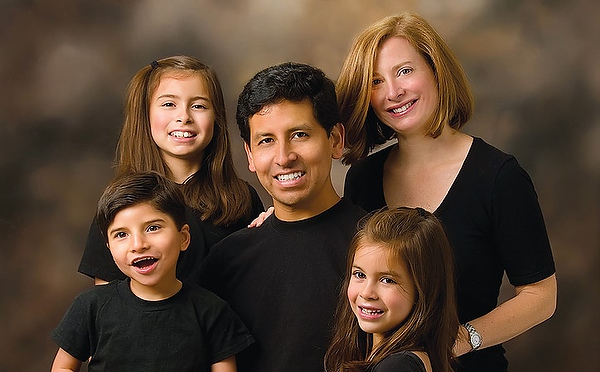 The Pauca family: Paul, seated, with Victor (left) and Francesca; Sofia (standing, left) and Theresa. On this day Victor finds his voice through a software application based on matching images with phrases. 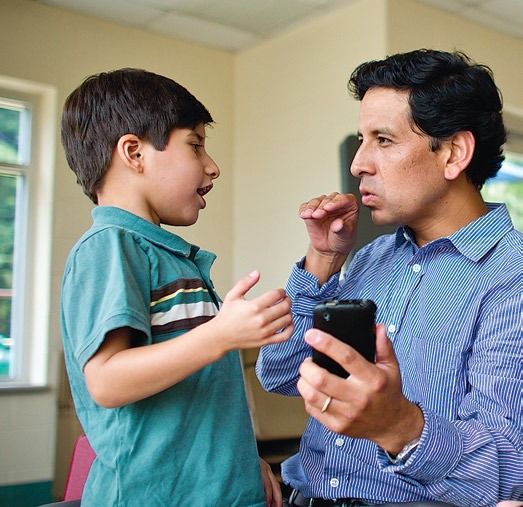 But this isn’t just any app: it is the brainchild of his father, Wake Forest Professor Paúl Pauca (’94, MS ’96), and his students; and it is named Verbal Victor for one dark-haired, charming little boy. Pauca, associate professor of computer science, and his wife, Theresa, sensed something was not right with their son early on when he fell behind in his developmental milestones such as crawling, sitting, walking and speaking. At age two-and-a-half he was diagnosed with Pitt Hopkins Syndrome (PTHS), a rare genetic disorder affecting his muscle control, speech and overall development. Now 5, Victor is a curious, active child who communicates through an engaging smile, sounds and hand gestures. 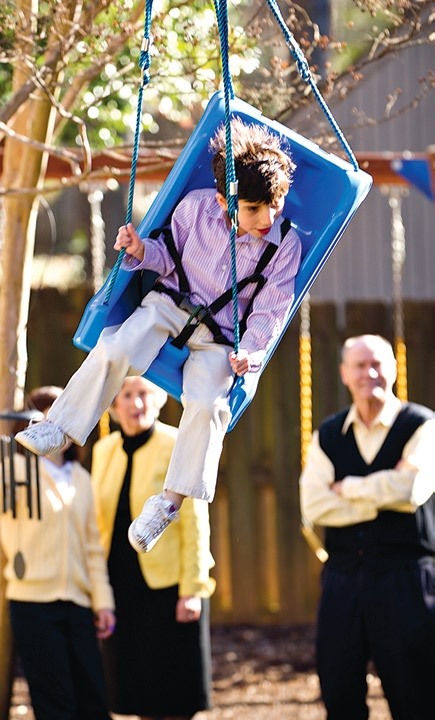 An active, curious boy, Victor enjoys a swing as his grandparents, Reynolds Professor Robert Plemmons (’61) and Mary Jo Plemmons, enjoy watching him. 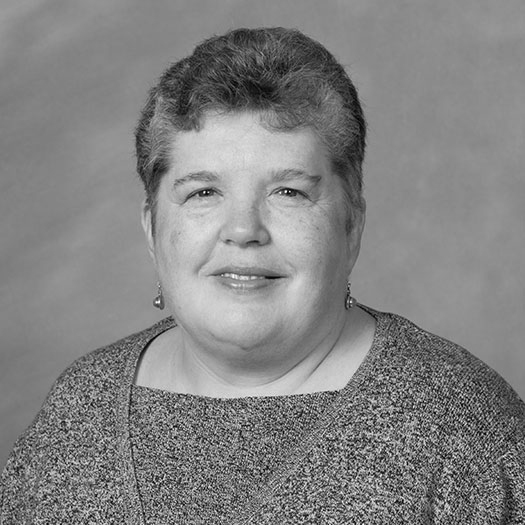 It was Theresa — a former special education teacher whose father, Reynolds Professor of Mathematics and Computer Science Robert Plemmons (’61), introduced her to the man she would eventually marry — who proposed the idea to her husband of pursuing a more adaptable, affordable AACD to improve life not only for Victor but also for others. Thus began an ongoing labor of love uniting professor, students, teachers, speech therapists and parents of PTHS children worldwide. Tommy Guy (MA ’09, MS ’10), lead programming engineer for Verbal Victor (top), says the development team wanted a simple, practical interface. Tommy Guy (MA ’09, MS ’10), a former graduate student of Pauca’s and now a doctoral candidate at the University of Toronto, was lead programming engineer. He says the team was looking for basic functionality with a simple interface using camera and microphone to enable customization. “And we wanted it to be affordable,” says Guy, who received funding from Wake Forest’s Center for Entrepreneurship to develop a prototype including new features. Verbal Victor has a dynamic display with customized image “buttons” accompanied by phrases that express the user’s desired action, such as “I want to eat” (a lunchbox) or “I want to play” (toys). It is simple to download on the iPhone/iPad and convenient for teachers and parents to adapt by adding pictures and recording new phrases. Best of all, it’s currently $6.99 on iTunes. As of mid-spring the app had been downloaded over 1,100 times worldwide. Paúl Pauca says the app has the potential to benefit many people with communication disabilities. 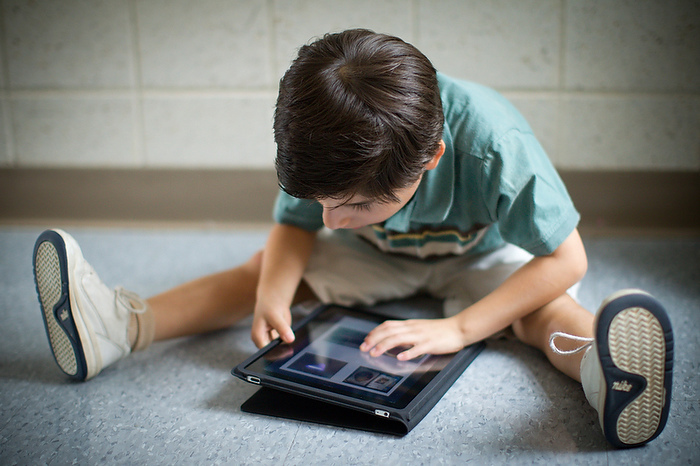 Pauca and team are working on a new version featuring page locking, image editing and the ability to combine buttons to make complete sentences. Developers are also looking at online button-sharing. Pauca is researching grants to further develop Verbal Victor. His goal is to use his expertise, mobile technology and knowledge regarding speech and communication to develop better and more affordable applications for people with disabilities such as autism, Parkinson’s disease and stroke. 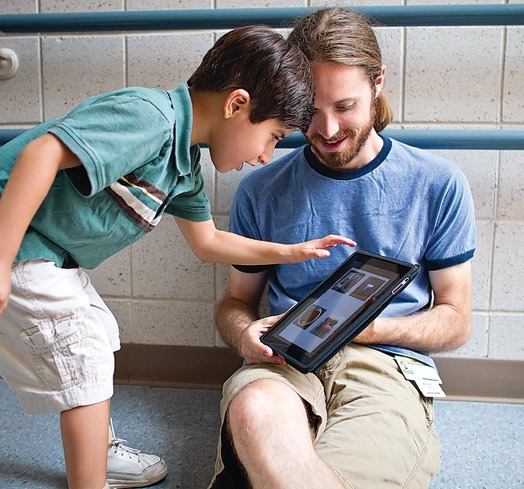 A software application helps Victor and his father, Paúl, communicate. When Victor was first diagnosed, his parents searched the Internet and found one other family whose child had PTHS. They formed an international support group that now numbers over 100 families and counting. 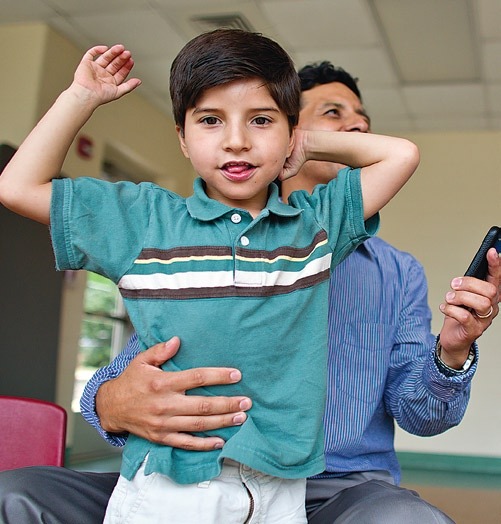 The Paucas organized a local faith-based support group for parents of children with disabilities, created the Pitt Hopkins Syndrome Fund under the Winston-Salem Foundation and the Pitt Hopkins Syndrome International Network. Together with other families they have raised $15,000 to fund research through 5K races around the country. The second annual Race for Victor and PTHS is scheduled for Oct. 1 at Tanglewood Park. As the Paucas forge ahead with PTHS awareness and research, the family mission of being better, not bitter, is heartwarmingly personified in Victor’s sisters, Sofia (11) and Francesca (8). They are their brother’s biggest advocates, reading to him, playing with him and bragging about his achievements. Francesca has “cooking lessons” for him every Tuesday and sets therapy goals for them to accomplish together. Younger sister Francesca, who is teaching Victor how to cook, helps him navigate the front steps to their home. Once Sofia and her father were discussing genes and DNA when she expressed interest in becoming a scientist who could work on those things. Pauca encouraged her to learn more about PTHS and maybe even discover a cure.